The teeth hold various functions and the loss of even just one tooth will bring about changes. You need your teeth to be able to smile, eat, speak and maintain a youthful appearance and when one or more teeth are lost, its replacement is important if you do not want to compromise any of those functions. Of the many prosthetic options made available to patients nowadays, dental implants are proving to be the best choice. With unquestionable strength and retention, tooth and bone preservation and high success rate, it has easily overcome traditional means. Unfortunately, though, it is not as cost-effective compared to other options. Implants screws, made of titanium metal, remain an expensive treatment option that only very few can afford. Uses only four (4) implants. 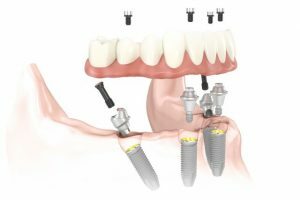 As the name suggests, it utilizes only four implants for complete full-arch mouth rehabilitation. Implant orientations are standard with two straight implants on the anterior and two tilted implants in the posterior. The use of just four implants significantly reduces treatment cost because tooth replacement no longer follows a strict 1:1 edentulous space to implant ratio. No need for grafts. Since the implant orientation on the posterior is tilted at 45-degrees, there is no need for costly and invasive bone grafts to alter bone. It permits immediate function. Most implants require two to six months of undeterred stabilization for the promotion of osseointegration. But as long as the patient passes criteria, he may be fitted with a provisional bridge to allow immediate function. No more ill-fitting dentures. If you are a long-time denture wearer and have had to deal with loose dentures that often get dislodged from the jaw and out of the mouth, you can definitely enjoy perfect support and retention for your set of teeth, with the help of all-on-4 dental implants. Whether you are after speed, affordability or conservativeness of treatment, you can rely on all-on-4 implants. In 1998, when it was first introduced, it definitely saw eyebrows raised but that was in the past. To date, many patients have been treated and are enjoying their all-on-4 implants. It has proven to be the best choice for full-arch rehabilitation in the retention of the implant-retained prosthesis, so that patients may continue to smile confidently, speak with ease, eat joyfully and appearance as youthful as they can be.